Mosher Hill Falls is an absolutely wonderful waterfall that is well known by local residents but lies outside of the normal realm for visitors. 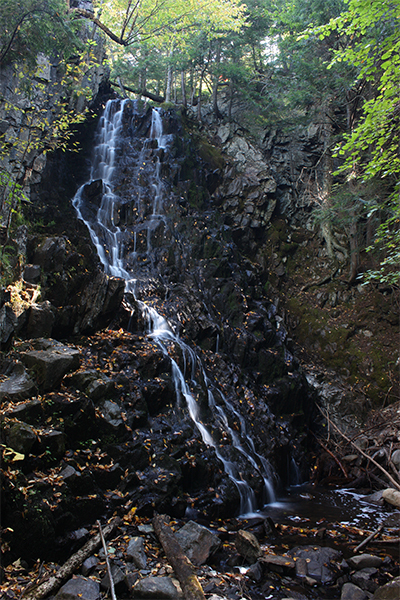 If you are on a quest to find a great waterfall in central Maine, this is surely one of them. Views of the waterfall from the easily obtained upper vantage point are minimal, but you can hear the sound of them clearly. With a moderately challenging bushwhack you can access the base of the falls for the best viewing. The water sprays over the rocks in a surprising display of beauty, especially given the often-limited power of the brook. This waterfall can be difficult to photograph as the base of the falls is within a dark and confined gorge. A wide-angled lens is very helpful in such conditions. Trail information and directions for this particular waterfall can be found in the latest edition of the guidebook: New England Waterfalls.